Meet Bob! 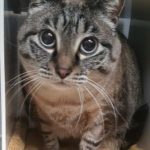 This sweet blue-eyed Siamese Tabby mix is looking for a place to call home. Bob can be a bit shy at first, but she warms up and is actually quite social once she adjusts. She would prefer to be in a quiet home and would love hanging out with you on movie nights or while reading a good book. Bob has lived both indoors and outdoors and thinks that a kitty-door would be pretty great! She would be happy to catch any mice that need catching for you, and she is great at using her litter-box! If you are looking for a sweet cat to add a little love to your house, Bob is the girl for you!